Know when we are calling all models for an open casting call for a new gig or ongoing project. See new products and learn more about this new video series and how we can get you cash for modeling. Want To Be A Model in a New Video Series? 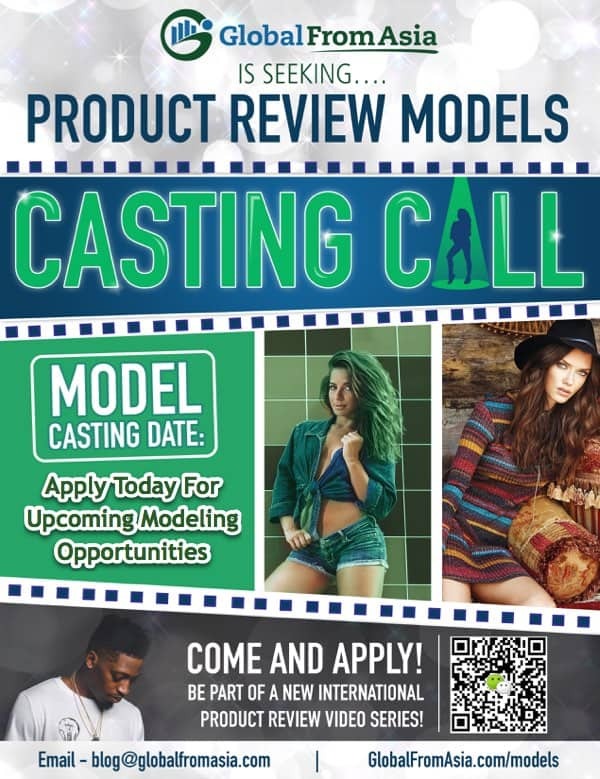 We are seeking female and male models to review products for our video series. We are looking for models from various backgrounds – Chinese, European, American, Australian, Indian, Filipino, we do not discriminate! We will then have recordings at the casting or 10 to 15 min online video interviews if you cannot come to a casting in person. Want to earn some extra cash as a brand model for top quality e-commerce brands? Global From Asia has a network of ecommerce sellers and Amazon FBA brands who need models to demonstrate how to use their product and grow their reach. So how does the Global From Asia model program work? We have various ecommerce brands in our network. Some we are partners in, others are friends and members of our community. As growing brands – have a demand to always add new content – product photo shoots, how to videos, brand videos, trailers, infographics, and more. By applying to be a model, you will be added to our database of potential models for these e-commerce brands. When we have a new request for a model shoot, we will alert you about it. Sometimes we also have live casting days, where we are asking models in the area to come to see if they are the right fit for a specific project we are working on. By being in our database, you will get updates about these special casting days and projects. Also get the opportunity to find long term brand ambassador programs where you will get ongoing opportunities to represent and promote these brands by being part of the content as well as promoting it on your own social media platforms. Wondering how to get to be part of this model network and opportunity? Check out GlobalFromAsia.com/models and learn about the latest opportunities and signup for the email notifications about future gigs and opportunities. Ecommerce and Amazon FBA brands are growing fast and need your help, let’s do this together. Interested in the model casting and brand ambassador program? Feel free to sign up now for updates!